Good morning all! We start the week here on Flatmattersonline with one of my biggest current motivations, Bri Welch! If you follow the FM instagram page, you will have seen the photo of Bri balancing with a prosthetic leg! Think about that, flatland is hard enough but throw in a prosthetic leg and I can’t even imagine. I met Bri at the Battle in the Rockies this year, and she is full of life and out there doing it and learning tricks. 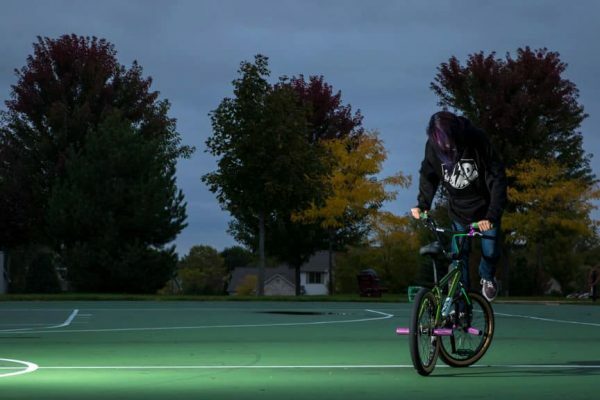 Paula Marie over at Rad Girls BMX caught up with Bri to tell her story, which goes so much deeper. Next time you are struggling for motivation, think about this girl and what she has gone through. Much respect Bri, over to Paula Marie.. I routinely scour the girls bmx scene, looking for new talent, I’ve been doing it well over a decade, pretty much since I started riding. But I can tell you that these past few years have been some of the greatest yet. Every so often I find someone that really stands out. Recently Bri Welch caught my eye. A girl showing up to ride at the Cornhuckit Jam, at the Midwest Indy Jam, and Battle in the Rockies. Bri has a real interest in riding that you rarely see, and she’s already planning to host a clinic this upcoming spring to inspire others to ride. Even though Bri just started flatlanding last spring it has been a whirlwind for her. Much of her life has been. From new flatland beginnings back to how it all started, Bri answers a few questions I asked her when we sat down for a chat in the proverbial cafe that is the internet. RG: When did you start riding flatland bmx? I actually bought my first bmx bike only about two years ago. I really only dabbled in Flatland after that, but have been more serious in my riding since this past spring. RG: Do you have any background experience in riding, or anything comparable? I started riding bikes as a child after major spinal surgery and complications from that surgery. I have always loved biking though. I remember riding with my siblings and friends doing what I thought were tricks. My dad was a big biker dude covered in tattoos and I had been a passenger on the back of his motorcycle since before I can remember. My Mom worked at Trek Bicycle in Waterloo, so my whole family always had bicycles and we all always rode. I was raised around all kind of bikes by bikers. RG: Spinal surgery sounds a long way from from flatland. What happened to your back that you needed surgery? I had a major spinal fusion when I was seven years old. Before that I was fairly normal, except I found it a bit painful to walk. My family would take me and my siblings for walks with our dogs around our neighbourhood, around the mall, or to the park. I couldn’t make it an entire block without my legs feeling tired or getting charlie horses. I was a small child that didn’t understand what was happening and I remember thinking that perhaps it was normal. So, I almost never complained or cried about it. I just said I needed a break and I would sit down right on the sidewalk or in someones lawn until the pain subsided or my siblings got annoyed for long enough, and then I kept going. My dad would often throw me up on his shoulders or he or my mom pulled me and my youngest sister in the wagon. I remember waking up in the middle of the night with immense charlie horses and I would cry and cry because they hurt so much and I was so scared because I didn’t know what was happening to me. At some point my parents took me to a my doctor where I was diagnosed with scoliosis and sent to a specialist. The specialist discovered that the pain I was experiencing was due to my spine impinging major nerves in my spine and my spinal cord. Hence the spinal fusion surgery when I was seven. The surgery wasn’t a success and left me paralyzed from the waist down. The doctors did a second surgery the next day, but had to go in from my belly this time. The second surgery wasn’t a fix. The surgeons told my parents as their seven year old daughter lay in a hospital bed in pain, drugged from surgery, after a million painful and scary tests, and barely conscious for weeks… that I would never walk again or live a normal life. I was eventually sent home in a bucky badger body cast from my chest to my knees. The cast was put on to allow my spine to heal properly as my bones were too small for rods and pins in the spinal fusion. This cast had me laying completely flat, in a reclined wheelchair, and looking a lot like a turtle for an entire HOT summer and into my first weeks of second grade. I was taken to physical therapy often to stretch my paralyzed legs, as they began to atrophy, and to try and move my legs. Towards the end of wearing the cast and not understanding or maybe even really knowing my diagnosis, I got super excited one day and showed my parents how I could wiggle my big toe! Then I started painfully regaining feeling in parts of my legs. It is difficult to explain and a longer story, but probably one of the most painful things I’ve experienced was that feeling, physically. Very slowly but surely I worked extremely hard for years in PT both at the hospital clinic and at home to regain what I lost. I relearned how to walk all over again. First in a wheelchair, then on parallel bars with heavy assistance, then without much assistance, to a walker, to crutches, to none! When I say years.. I mean I never fully recovered. I was in some sort of PT until I was in about 5th grade. I was required to wear these giant and uncomfortable leg braces, like Forrest Gump, because not all of the nerve damage had recovered, leaving me with ankles that were weak and didn’t function fully. They still don’t. Well, the one I have doesn’t anyways. I’m not entirely sure how to make this “short story” short or end.. It really doesn’t end.. Later when I was 15 I was run over by a drunk driver in my Mom’s driveway. Breaking my spine and the fusion, my shoulder, most of my ribs in multiple places, and my pelvis. This recovery process then leads into how I eventually lost my leg. RG: Wow. That is a lot to go through, in any one of those situations, I can’t believe all that happened to you. It is pretty impressive to take on flat after all that, because you either have to be fit to ride flat, or at least very strong. I definitely haven’t been through what you went through when it comes to my body, but I know what its like to be weak and not able to do the things you once could. It’s incredible that you found flatland, of all things out there, and decided to do it. 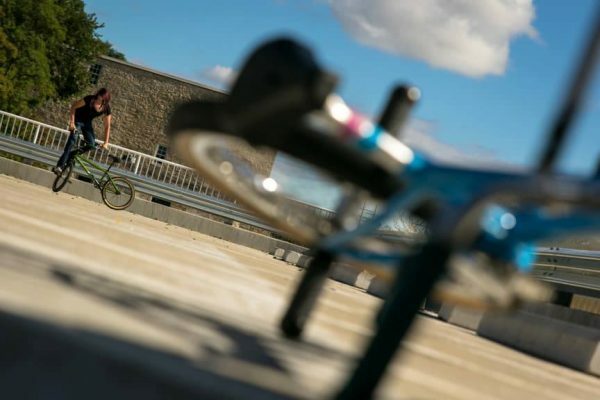 When I first saw someone ride flatland, my jaw dropped and I was immediately drawn in! It was this beautiful underground art, complex, completely alien way to ride a bike. I have always, always absolutely loved riding bikes and this was just this whole new level and I wanted in. 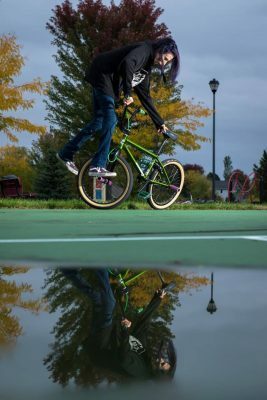 Over the years I was exposed to bmx I came to realize bmx was really more than just riding bikes and doing these amazing tricks. I was, in a way, unconsciously drawn to the family or community feel of bmx. These riders were accepting of each others differences in life and riding styles and pushed each other. I love the way I feel when I’m out on my bike. And it doesn’t really matter if I am or if I’m not landing tricks, out cruising around, or if I’m pushing my limits to ride hundreds of miles on a trail. Riding clears my head and I almost always ride out in a better mood, with a new goal, or a changed mindset. I love the challenge, the push, and inspiration from riding and from other riders. RG: So how did you get your first flatland bike? For a long time I didn’t even have my own bike. 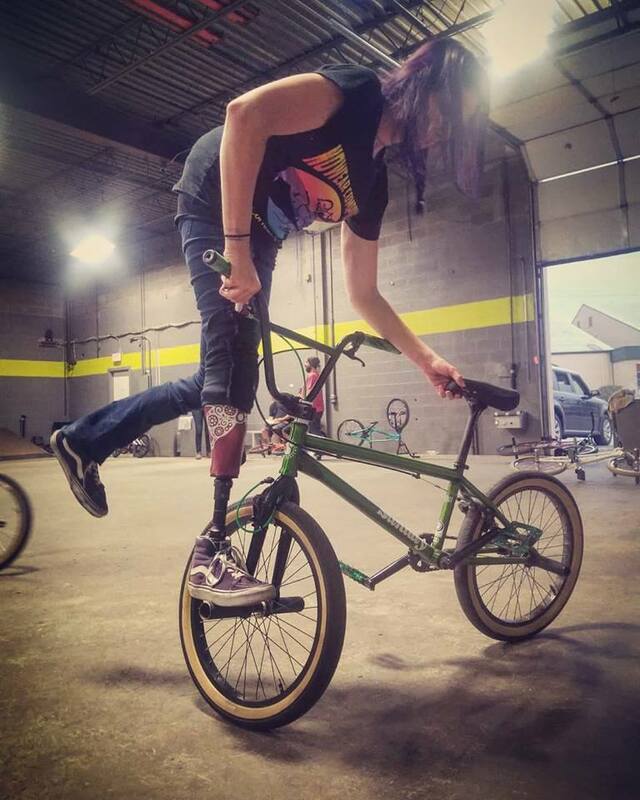 I maybe pushed around a little on friends’ bmx’s, but it wasn’t until after a very long battle from an illness, many surgeries, a very long recovery, and regaining my health again, that I would have the strength within myself to ride just for the sake of my love for riding. I had actually been rolling around on a Trek road bike. I started playing around on my bike and attempting little tricks. I wanted a bmx, but felt unsure of myself on such a small bike. Haha I wasn’t the only one that felt unsure about me riding around on a 20″. 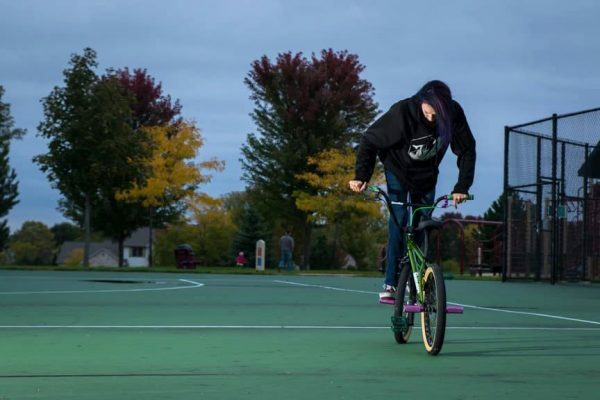 I was told I would very likely get hurt, or that it might be too difficult for me with my leg and all, that I would be starting a sport that many start as kids, and if I got a bmx bike everyone had their opinion of the style and size of the bike I should get. Not many people, if anyone really encouraged me to ride bmx and I think I let that fuel me. They didn’t know me like I did. I started attempting bmx tricks on my Trek road bike. Like no footers, cancans, crossing over the bike and standing on one side on the pedal, no footers, no hands, and as strange as it sounds, I had actually just started learning to pedal while not seated after becoming an amputee for the first time as well. I couldn’t very well ride Flatland bmx on a Trek road bike though. I eventually went to my local bike store. After test riding a few complete bikes, I decided on a Sunday. Not your typical Flatland setup, but it felt most comfortable for me and it wasn’t a road bike. Haha I had only barely rode friends’ bmx bikes and felt with my prosthetic leg that the shorter the top tube and lower the seat was the more difficult it was to pedal. So, a bigger bike with a taller seat post was it! I am very careful with my money and often forget about myself when it comes to spending, especially after being sick a few years ago and just coming out of debt from medical bills and such. Like I said I test rode a few of the bikes before deciding on the Sunday. As I approached the register with the bike, I started feeling super anxious and felt like I couldn’t afford this bike right now and I began to sort of panic. So, there I was standing at the register about to purchase my first bmx bike probably as pale as a ghost and holding back tears. When the kid behind the cash register told me the price I started to have a mini panic attack! But, with some encouragement and a reminder that we all only live once and self love was important, I swiped my debit card and bought the bike! As soon as I got the bike outside, it hit me that the bike was mine I balled like a baby! I cried with excitement and joy and in dread and regret. Haha! Best decision I ever made! Some of the greatest flat riders ride street style set ups. It really depends on your style, and I think a Sunday was a great choice. Everybody gets hurt riding bmx, its sort of part of the deal, right? You just have to try and moderate it as best you can. I mean, I have to go to work the next day, haha. Self love is important. RG: Where do you see your riding in 5 years? I see myself still learning, going to jams and competitions, and having a blast riding with all the rad friends I’ve made over the years. RG: If you could go anywhere, what 3 flatland events would you really like to attend? I would love to ride at a New Orleans jam or competition, Battle in The Rockies 2019, and York! RG: If you could go with 2 other riders, who would you bring? Anthony Schneidewind and Kim Klisiak. Haha, I’ve been on plenty of those Kim Klisak road trips myself. You can’t go wrong! RG: So with everything you have going on, what keeps you motivated? What keeps me motivated.. I suppose my love for being on a bike and the feeling I get when I’ve pushed myself and accomplished a new thing I didn’t know was possible for myself. I feel like I am always pushing my limits and challenging myself to new heights. I think that leads into my spinal surgery when I was a kid and relearning how to walk all over, and relearn everything all over from the waist down. RG: What tricks have you been working on? And what sort of style do you like to see? Haha Im no good at trick names.. Im I currently working on the basics I guess. Scuffing in tighter circles, fork guide to scuff, track stands, infinity rolls, backward steam roller. I love watching riders do decades, variations of steam rollers, pinky squeaks, and old good fashion wheelies. I love seeing riders put their own spin on tricks. Oh, and Bar rides look insane and fun too. RG: Who are your favourite riders? That’s tough actually. The riders I first saw and inspired me were my friends, Shawn Burrington and Anthony Schneidewind. And now I’ve met so many more riders that inspire me and push me to ride harder and that help me see my potential. Anthony Schneidewind, Kim Klisiak, Robert Reilly, Jason Rideout, Dave Nourie, Effraim Catlow, Kendra from Colorado (unsure of her last name but she’s a legend in women’s flatland!) I am also really inspired by a podcast I heard just before I really got into Flatland because his story hit a few of my heartstrings and feels a bit similar to myself. His name is Garrett Byrnes. Also, as an amputee I look up to other fellow amputee riders such as Kurt Yeager and Odair Costa (only other flatland rider that is also an amputee that I’ve heard of).